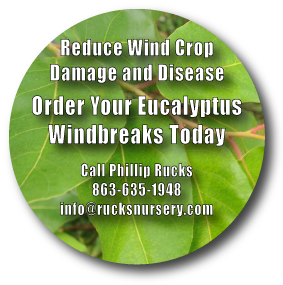 The proven rapid growth of Eucalyptus trees make them an ideal windbreak for fruit trees, citrus and vegetables. A well-designed windbreak located in the direction of a prevailing wind can increase crop yield, reduce soil erosion, influence microclimate around the crops, increase irrigation efficiency, and control the spread of some pathogens. Studies have shown that the effective distance of wind reduction on the lee side (protected side) of a windbreak ranges between 10 to 30 times the height of the windbreak. Eucalyptus Trees can grow to 50 to 60 feet in six years which offers a windbreak protection ratio of 100 feet of protection for every 10 foot of tree height. 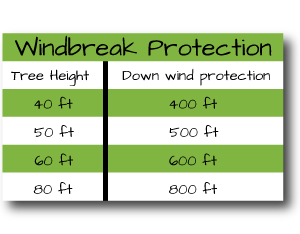 This provides protection from wind and disease for crops up to 600 to 1800 feet.